If you are PCSing to New London Naval Submarine Base, this PCS Guide will help you get a better feel for the areas that surround the base. This guide will help you narrow down your search and hopefully reduce your level of anxiety. If you have additional questions about this PCS Guide to New London Naval Submarine Base, feel free to contact us or join our Facebook Group. Download the complete guide and begin your PCS research! Naval Submarine Base New London is the United States Navy's primary East Coast submarine base, also known as the "Home of the Submarine Force" or the "Submarine Capital of the World". It is located in Groton, Connecticut. The base supports twenty-one attack submarines and the Navy's nuclear research deep submersible NR-1. 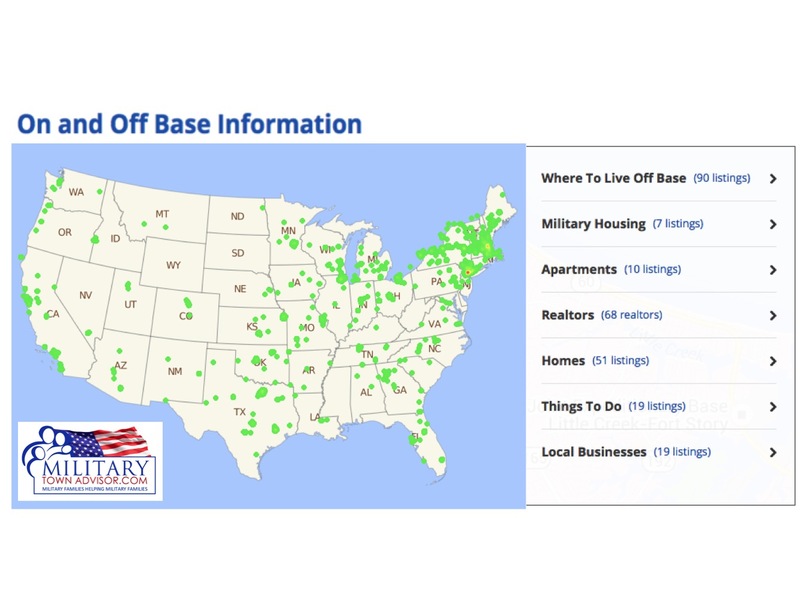 Housed at the base are more than 40 tenant commands. Located approximately 2 miles away, across the river, connected by the Gold Star Memorial Bridge, is the US Coast Guard Academy. The United States Coast Guard Academy is the service academy of the United States Coast Guard, founded in 1876 and located in New London, Connecticut.The US Coast Guard Academy provides education to future Coast Guard officers. Cadets graduate with one of eight majors and are obligated to five years of active duty service upon graduation. Unlike the other service academies, admission to the academy is based solely upon merit and does not require a congressional nomination. Due to the areas rich history, towns near New London Naval Submarine Base have a unique way of classifying themselves as towns, villages, and/or cities. Many of the geographic locations have changed over time so it can get confusing at times when trying to describe different neighborhoods vs towns, however we will do our best to break down the different areas. Groton, New London, and Norwich are the 3 'bigger' cities surrounding New London Naval Submarine Base. Each of these cities are very different and uniquely intertwined with smaller towns and neighborhoods aka 'villages'. The New London County contains a large area consisting of New London-Norwich Metropolitan area. Scroll down for a detailed list of New London County. Several military installations have been part of New London's history, including the United States Coast Guard Academy and Coast Guard Station New London. New London is bounded on the west and north by the town of Waterford, on the east by the Thames River and Groton, and on the south by Long Island Sound. New London is a bustling town with local and tourist culture filled with an active downtown area with bars, restaurants, shops, and historic sites. With Mitchell College and Connecticut College located within New London, this area is filled with college students mixed with military service members. This area is known for its nightlife and located close to 2 major casinos in the area. The area is very diverse and there are pockets of nice communities located in New London. Norwich is an early industrial center, where the first paper and iron nails were made in the mid-1700’s. Norwich is fairly industrial but has a modestly attractive downtown with an area of historic buildings. Groton is a town located on the Thames River in New London County, Connecticut. The population was 40,115 at the 2010 census. Groton is the home of the Electric Boat Corporation, which is the major contractor for submarine work for the United States Navy. The Naval Submarine Base New London is located in Groton, and the pharmaceutical company Pfizer is also a major employer. Avery Point in Groton is home to a regional campus of the University of Connecticut. Groton has a nice mix of local and chain restaurants. It’s located on the water allowing for a lot of outdoor activities and fun things to do. With great public schools and magnet schools, this area is very diverse with higher prices. Groton has a strong community feel attracting many families making it a great place to raise kids. This area is popular so traffic can be an issue at time. Noank is a village in the town of Groton in New London County, Connecticut. West Mystic (west of Mystic river) is a small portion of Mystic in Groton, while most of Mystic is located in the neighboring town of Stonington. Other areas of Groton are Historic Burnett’s Corner and Groton Heights, Groton Long Point, Long Hill, Poquonock Bridge/Fort Hill and the Submarine Base area “Conning Towers-Nautilus Park"
The town of Stonington is located in New London County, Connecticut, in the state's southeastern corner. It includes the borough of Stonington, the villages of Pawcatuck, Lords Point, Wequetequock, and the eastern halves of the villages of Mystic and Old Mystic (the other halves being in the town of Groton). The population of the town was 18,545 at the 2010 census. Old Mystic and Mystic (east of the Mystic River) is named the #1 best place to live near New London Naval Base and many military families choose to live in this area. Mystic is a very charming coastal town with a hometown feel. This cozy town has an artistic feel with lots of antique shops, great places to eat, and lots of interesting local history. Shopping is ample in town with small shops that offer unique items which is a contrast to the more 'big box stuff' in Groton and New London. Many military families live here and boast about the towns walkability. The area is beautiful, and there is low crime. It's right on the water and there's an abundance of outdoor activities in the area with a close proximity to local beaches along LI Sound and Block Island Sound in CT. Mystic is famous for its Seaport museum which houses ancient sailing ships, and the Mystic Aquarium too that houses the Beluga Whales. Pawcatuck is a close community making it a great place to raise kids. Pawcatuck is a full of beautiful scenery, playgrounds, docks, candy store, big stores and mom and pop stores. There are a lot of things to do, especially the beaches in the summer time. Many popular beaches are located nearby in Westerly, RI. Westerly, RI is located across the state border and is the epitome of small town living, where people are born, grow up, and live here there entire lives. Westerly is small beach town with an old town feeling just 20 minutes from base. It has a strong sense of community, in some cases dating back generations. There are annual events that the entire community look forward to each year. There are activities on the beach all the time, such as drive in movies, go carts, golf, live bands on the beach which makes for fun things to do, but the town is very touristy in the summer. There’s a ton to do in the summer, but the town slows way down in the off season. Ledyard is a small town with a great sense of community making it a great place to raise kids. The community supports school activities, sports and local clubs. It’s common to see the entire community at the High School football game each weekend. It’s a close knit community where most people know each other and it’s very safe with good schools. Ledyard is a quick commute to New London Naval Submarine Base. 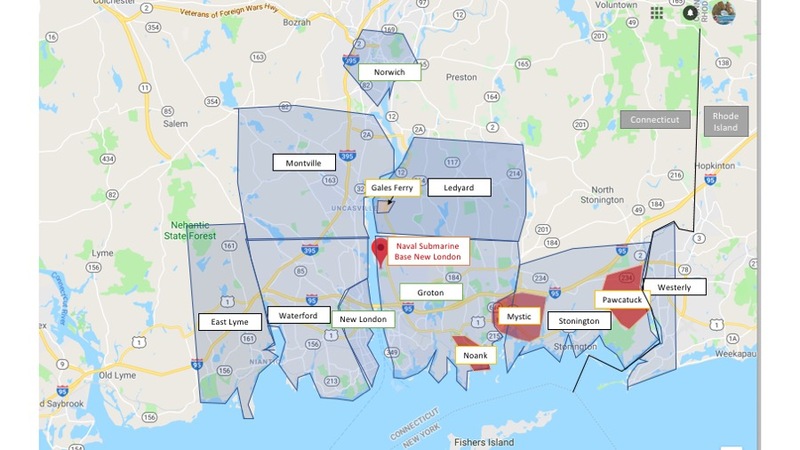 The principal communities of Ledyard are Ledyard Center (also known as Ledyard Village) and the Gales Ferry section (including Christy Hill Estates, Devonshire Estates, Ferry View Heights, Glenwoods, Birdland, Sherwood Forest, and Woodridge Estates). Gales Ferry is a village in Ledyard. It is surrounded by beautiful scenery filled with lots of outdoor activities. This is a very popular area where a lot of military families choose to live. It has a short commute to base and a great sense of community with a good school system. Montville is a town in New London County, Connecticut. The population was 19,571 at the 2010 census. Montville is a great community. There may not be as much to do as other parts near the base, but it is a great place to live. Just like other communities, there are pockets of good and not-so-good neighborhoods in Montville. The villages of Chesterfield, Mohegan, Oakdale, and Uncasville are located within the town; the latter two have their own ZIP Codes. Town residents often identify with these villages more than the Town of Montville as a whole, and the Mohegan Sun casino resort is nearby. Waterford is a town in New London County, Connecticut. The population was 19,517 at the 2010 census. Principal communities include Graniteville, Jordan, Millstone, Morningside Park, Quaker Hill (Bartlett Point, Best View, Cohanzie, Thames View. Quaker Hill is a great community with lots of things to do for families. It’s quaint, quiet and safe with an inviting feel and good schools. East Lyme is a town in New London County, Connecticut. The population was 19,159 at the 2010 census. East Lyme is a quaint, friendly, shoreline town that has a lot to offer. Oceanside parks and beaches are a main attraction for locals and summer tourists. Local businesses and restaurants brings life and true New England spirit to the town. Small enough to have a tight knit sense of community, but large enough to be recognized for its accomplishments on a national scale. Whether you are looking to buy or rent a home, search our large database of Military Friendly Realtors near New London Naval Sub Base. Real estate agents can help you narrow down your search and keep you in the loop when houses come on and off the market. Search MilitaryByOwner's military homes for sale or rent near New London Naval Sub Base.